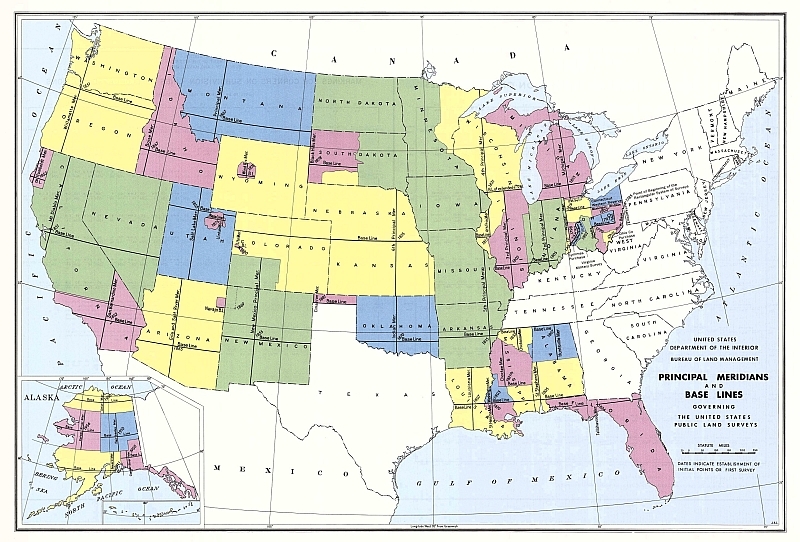 Land parcel descriptions found in land patents (or grants), deeds, and abstracts for property in most states admitted to the union after the Revolutionary War are defined by the Public Land Survey System (PLSS). 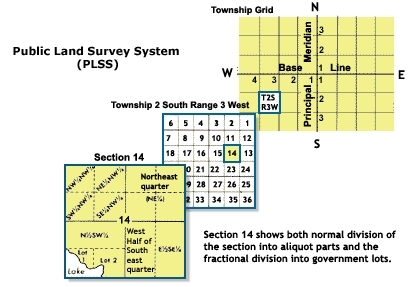 PLSS is a uniform system for surveying the country that was first proposed by Thomas Jefferson. It consists of flat planes containing a grid of uniformly sized townships (six miles square) and 36 sections (1 mile square) within each township. Land surveys require a starting point from which all measurements are referenced. For PLSS, this reference point is a principal meridian and baseline. As the surveying progressed, different principal meridian/baseline pairs were defined in various parts of the country. (See the map below.) This also reduced the problem with earth curvature if a single flat plane were used over a wide area. For the state of Missouri, the descriptions are based on the Fifth Principal Meridian. The origin of the rectangular coordinate system, i.e. the intersection of this meridian and its baseline, is centered at 34°38′45″N latitude, 91°03′07″W longitude (at the Arkansas Louisiana Purchase Historic Park east of Little Rock). Legal land descriptions of a parcel are expressed in a TRS (Township, Range, Section) coordinate system. The numbering that is used is shown in the second figure below. Townships are numbered north and south of the baseline. 'Range' is a strip of townships numbered east and west of the principal meridian. Section numbering starts in the northeast corner of a township and continues in a serpentine manner across and down in the township. A section consists of 640 acres, but most land grants were 40 acres (or multiples thereof). To handle this, each section is divided smaller segments (called aliquots), namely four 160 acre segments and those segments were then divided into four 40 acre segments. The aliquots are numbered directionally from the center of those blocks, e.g. the 40 acres in the northeast corner of a section is referred to as the NE¼ of the NE¼ of Section x. Larger parcels, such as two adjacent 40 acre blocks ( i.e. 80 acres), are referred to by direction in the segment, such as N½ or E½. Parcels that did not conform to these rectangular divisions were defined as Lot 1, 2, etc. The area within one mile of the I70 junction at Concordia consists of the following townships/sections: Township 49N-24W Section 33, Township 49N-25W Section 32, Township 48N-24W Section 5, and Township 48N-25W Section 4, all referenced to the Fifth Principal Meridian. For example, Conrad Stuenkel's first 40 acre land purchase just north of Concordia was the NW¼ of the SW¼ of Township 49N-24W Section 33. Map of principal meridians in the U.S.